The first part I needed was my suitcase, which I found on Etzy for a low price of $25. Of course the real steal was in the $25 dollar shipping so the suitcase really cost my about $50 dollars in total. The suitcase itself is an antique from roughly the 50s and it is probably model no. 150, as the cardbard in the bottom indicates. After I ripped out all the interior and removed the cardboard I was left with a stark wooden and cardboard interior. The outside is well worn and will contribute to the speakers character considerably. My next parts were of course the speakers. 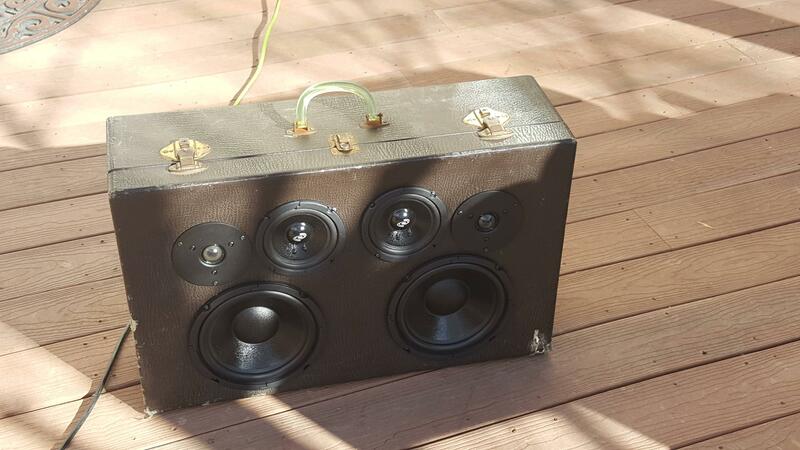 Knowing I had blown quite a bit of cash on my suitcase, I did not want to spend hundreds on my speakers. 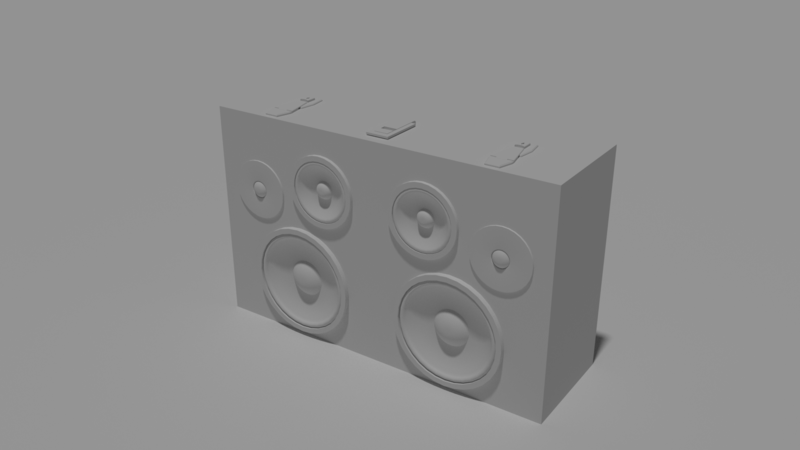 Because of the massive dimensions and some planning I did on blender, I decided to go with 6 speakers, two Woofers, two Tweeters, and two Mids. I also decided on a setup I liked as you can see on the left. The model I created was about 1/8" acurate and I put more time that I should have into it. Once everything showed up I began the process of removing all the extra glue residue from the walls of the suitcase. I then measured out all the holes I would need and cut them out of a sheet of birch plywood with a jigsaw. 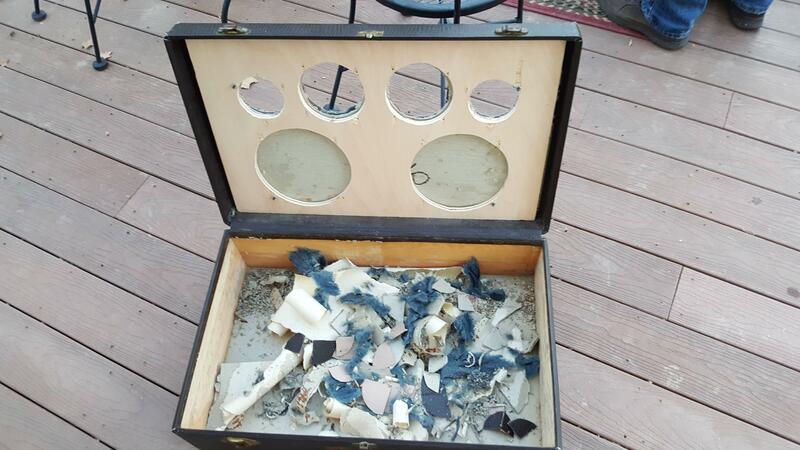 I then mounted it in the suitcase and began cutting out the holes where the speakers would sit. 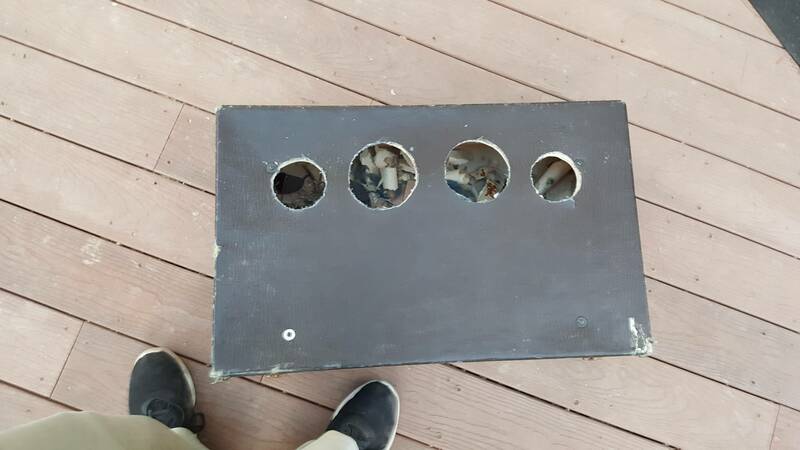 As you can see on the right I had carved out 4 of the 6 holes required by the speakers. The Hardest part of this process was the 1/2" thick walls of cardboard that made up the front and back of the suitcase. I ended up having to remove half of the cardboard to even install the plywood. As you can see in the above image, There was quite a bit of it, and even some insulation that would keep the clothing warm. I found that using a strait edge knife was the easiest way to cut my way through the cardboard and leather outside. My final stopping place so far has been mounting all the speakers and attaching all the wires to the inside of the suitcase. I will be getting my Amplifier so I can test it out and decide if I need more power to drive my speakers. That is dope my dude.